Maureen O'Hara continued to act steadily in movies throughout the 1950's and 1960's, including baby boomer favourites The Parent Trap (1961) with Hayley Mills and Brian Keith, and Mr. Hobbs Takes a Vacation (1962) with Jimmy Stewart. Brian Keith and Maureen O'Hara were paired again onscreen in The Deadly Companions (1960). Below, Maureen O'Hara and James Stewart are featured in the movie trailer for Mr. Hobbs Takes a Vacation. 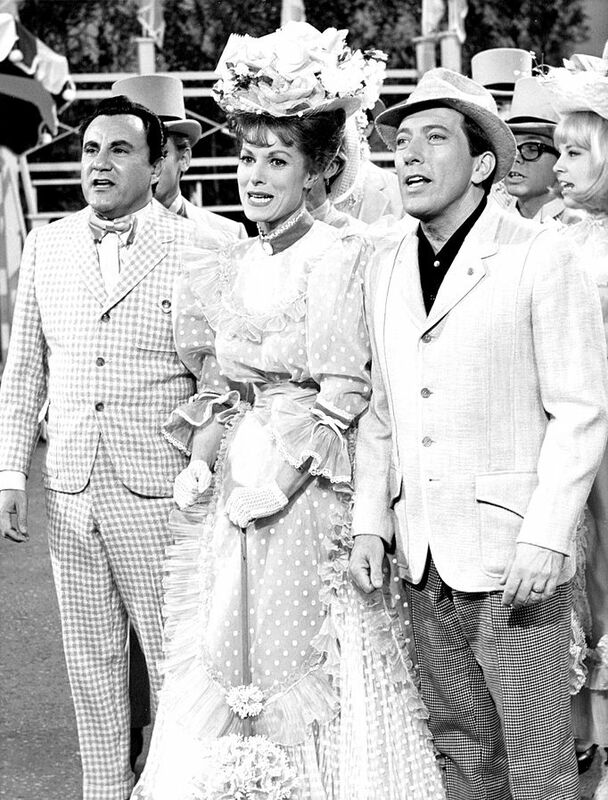 Maureen O'Hara began making television appearances on variety shows starting in 1958 (ie, The Pat Boone Chevy Showroom) and showcased her singing talents. O'Hara starred on Broadway in the musical Christine (1960) and released two albums. The comedic western McLintock! (1963) paired Maureen O'Hara and John Wayne onscreen again in their first movie since the war drama The Wings of Eagles (1957). Their co-stars in McLintock! included John's son Patrick Wayne, Stefanie Powers, Jack Kruschen, Chill Wills, Yvonne De Carlo, and Jerry Van Dyke. Below, John Wayne and Maureen O'Hara in a scene from one of their five movies together, McLintock! (1963). Maureen O'Hara was reunited with two of her former leading men - Brian Keith and James Stewart - in the western The Rare Breed (1966). In the cast of The Rare Breed with them were Juliet Mills, Don Galloway, Jack Elam, and Ben Johnson. After shooting The Rare Breed, Maureen began filming less movies. On a stopover visit to L.A. in 1967, now-divorced pilot Charles Blair was told by Maureen O'Hara's brother Charlie to see if she could take his place at dinner with Blair. Maureen's relationship with Enrique Parra was over. During dinner she and Charles caught up on each other's lives - he had four children from two of his previous marriages - and began regularly going out when Charles Blair was in L.A.
On March 11, 1968 Maureen O'Hara and Charles Blair were married, 19 years after first meeting. It was Charles Blair's fourth marriage; he was by now retired from being the Senior Pilot with Pan American World Airways, and a Brigadier-General in the air force reserve. Blair had been in the secret service and was an aviation pioneer, making the first single-jet flight engine over the North Pole and setting a nonstop flight record from New York to London in the 1950's. Maureen O'Hara and Charles Blair bought a holiday home in Glengariff, West Cork (Ireland) called Lugdine Park, but resided primarily in St. Croix, U.S. Virgin Islands. Blair had started Antilles Air Boats Inc. there in 1963; it was a flying boat service operating between the Virgin Islands and Puerto Rico. Maureen O'Hara's Close friend John Wayne visited them frequently in St. Croix. Maureen O'Hara retired from big screen acting in 1970 after shooting on Big Jake (1971), her last picture with John Wayne, was completed. Their Big Jake co-stars included Richard Boone, Christopher Mitchum, Bobby Vinton, Bruce Cabot, Glenn Corbett, Harry Carey Jr., John Doucette, Jim Davis, John Agar, Gregg Palmer, and two of John Wayne's sons - Patrick Wayne, and Ethan Wayne. 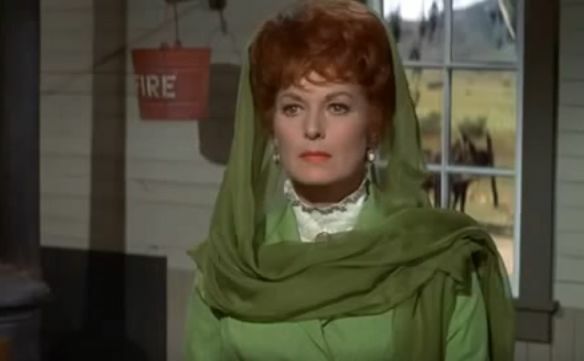 Although she appeared in the odd tribute or documentary television special celebrating John Wayne or John Ford, Maureen O'Hara was essentially retired completely from acting while she was married to Charles Blair. Her daughter Bronwyn FitzSimons Price (an actress) gave birth to a son in 1970 - Conor Beau FitzSimons, making Maureen O'Hara a grandmother at age 50. While Maureen O'Hara was recuperating from cancer in Ireland in 1978, Blair was flying his plane in the Caribbean and experienced engine failure; the plane crashed and he died. Maureen had been on the Antilles Air Boats board of directors, and after his death she was elected CEO and President - making her the first woman president of a scheduled airline in the US. The company was sold soon after, but she remained as president until 1981. Maureen O'Hara never remarried. Spending her summers in Ireland, Maureen founded the annual General Charles F. Blair (for men) and Maureen O'Hara-Blair (for women) Golf Tournaments in 1984, and attended them each summer as a young senior citizen. Heart attacks in 1989 necessitated two angioplasties and could have sidelined Maureen O'Hara forever, but in 1991 she came out of retirement at the age of 71 to co-star in Only The Lonely, playing actor John Candy's mother. During the remainder of the 1990's and into the 21st century, she appeared in made-for-television movies such as The Christmas Box (1995) and documentaries. The movie trailer for Only the Lonely (below) features John Candy, Ally Sheedy, James Belushi, Anthony Quinn, and Maureen O'Hara. On the subject of aging and old age, when asked if she felt 82 years old back in 2003 by Larry King, Maureen O'Hara had this to say: " No, I don't. I had a sister who said something and it's true. She said, Old age is a terrible thing, particularly when it strikes you when you're so young." She commented that when she looked at many of her old movies, her co-stars were all gone, and predicted that she would live to be 102 years old. Previously she had told King in an earlier interview (2000) that she felt retirees should stay busy: "There's always something you can go out and do. You can volunteer and the one thing necessary today is people who are old and have retired and have nothing to do, why don't they go out and offer their time and teach the children today to read and write? It is so important, because all this computer stuff, children are not learning like they used to learn." Maureen O'Hara wrote her 2004 autobiography 'Tis Herself with help from Johnny Nicoletti, from her L.A. home. After suffering a stroke in 2005, she began spending more time at her home in Glengariff, Ireland, while maintaining homes in Arizona and St. Croix. Her last professional appearance on film was at age 90, in 2010's Dreaming the Quiet Man, a documentary. Fiercely proud of her Irish heritage, Maureen O'Hara has received numerous awards and recognition for her contributions to Irish and American film. Although she was never nominated for an Academy Award for her work in a specific film - she said she was cheated of a nomination by John Ford for her role in The Quiet Man - she received a Lifetime Achievement Award from the Irish Film and Television Academy in 2004 and an Honorary Academy Award Oscar for her Lifetime Achievement in Film in 2014. Below, Maureen O'Hara being interviewed by Robert Osborne at the TCM Classic Film Festival, complete with pictures and stories from her childhood in Ireland and her movies. Her grandson Conor Beau FitzSimons wheels her in. In 2012 O'Hara's family grew concerned over her care in Ireland due to her advanced age, short-term memory loss and increasing frailty. Claims of elder abuse by a personal assistant that Maureen O'Hara had given power of attorney to were investigated by social workers, and Maureen ended up moving to the US. Nonagenarian senior citizen Maureen O'Hara is confined to a wheelchair and now lives in Boise, Idaho with her grandson Connor Beau FitzSimons and his family. Lugdine Park, her home in County Cork, Ireland since 1968, was put up for sale in March of 2015. Happy 95th Birthday, Maureen O'Hara. Update - Maureen O'Hara died in her sleep from natural causes on October 24, 2015. Farewell, Maureen O'Hara.